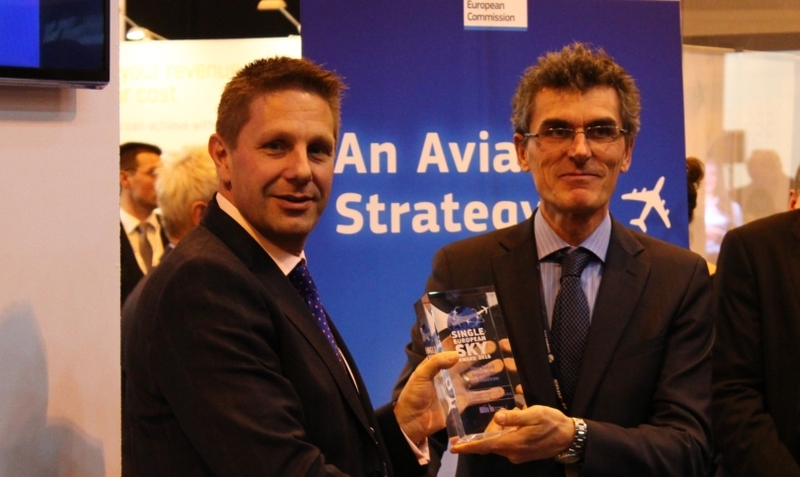 NATS and its project partners were unveiled as winners at the inaugural European Commission Single European Sky yesterday. Held in Madrid as part of the CANSO World ATM Congress, the awards celebrate the best examples of collaboration within the air traffic management community, helping to make a Single European Sky a reality. The introduction of Time Based Separation (TBS) saw recognition for NATS and its partners Lockheed Martin, Heathrow Airport and EUROCONTROL. Designed to help maintain the landing rate during strong headwinds by dynamically calculating aircraft separations, TBS has been hugely successful in cutting delays at Heathrow. In November 2015 alone the system saved 25,000 minutes of air traffic flow management delay and is on track to more than halve overall headwind delays at the airport. TBS is mandated to be in operation at Europe’s busiest airports by 2024 and many of the lessons learned from its development and the work to take it from a concept to implementation will be invaluable to other ANSPs in the coming years. European Commission Director-General for Mobility and Transport, Henrik Hololei, said: “I’m sure that all the airports, the airlines, air navigation service providers, the manufacturers and many other actors of the European aviation system, know very well how important the achievement of the Single Sky is for Europe’s economy and citizens. However, it’s also important to recognise specifically those who are going the extra mile in helping the European Union complete the Single European Sky. The Borealis Alliance of ANSPs, of which NATS is a member, also scooped an award for its programme to introduce Free Route Airspace across northern Europe, stretching from the eastern boundary of the North Atlantic to the western boundary of Russian airspace. Implementing Free Route Airspace across such a huge expanse of airspace is unprecedented. The success of the programme so far and the planned developments through to 2021 will provide a considerable contribution to the implementation of a Single European Sky, enabling shorter routes and lower fuel consumption and emissions.